Spending time talking to Billy F. Gibbons about guitar is never a dull experience. 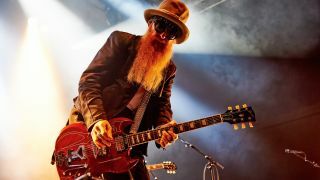 The heavy-bearded blues hound formed ZZ Top at 20 years old, having spent the end of his teens opening on the Jimi Hendrix Experience’s first American headline tour with early band The Moving Sidewalks. The man has stories. Now as an elder statesman for the blues, at 68, despite the multi-platinum record sales and long-cemented stature as one of rock ’n’ roll’s true legends, he’s held onto that same passion that brought him to the forefront of guitar music so many moon ago. And it’s both evident and infectious from the moment the man sits down. He will play YouTube videos from his phone, howling with laughter as old masters - many of whom feature on his list of 10 guitarists below - twist the listener’s ear, before showing you pictures of various instruments and projects he’s working on back at home. There’s a secret language to the blues - you need to say it without saying it! “Now it’s buttoned up and delivered, the really interesting aspect of this project is how its start-up was so unplanned,” reveals the singer/guitarist with that trademark baritone boom. It was this impromptu, serendipitous essence to the music that became its modus operandi. Earlier this year, Gibbons also announced the arrival of his new Seymour Duncan Red Devil pickups - recreating the tone from his 1959 Pearly Gates Les Paul in an unsuspecting, quietly confident single-coil sized form. The set features three unique pickup winds and specially calibrated Alnico 5 magnets, handwired in the Santa Barbara factory, promising enough meat to beef up your Strat and provide the fat tone of Billy’s #1. “There’s a sense of the magic you get with Seymour Duncan and his great team of expertise,” nods Gibbons. “There’s another interesting pickup that we will be employing on this run,” adds Gibbons. “We’re taking The Big Bad Blues on the road. I’ve hired [ex-Guns N’ Roses drummer] Matt Sorum, he’s behind the drumkit, and Austin ‘Left Hand’ Hanks will be on second guitar. We’ll be using a pickup designed by Andy Alt - his offering is called A Little Thunder and it has this peculiar extra feature which allows the bottom strings to be identified and thrown an octave below. So you’re playing guitar and you have an accompaniment in the bass register. “I call attention to a dear friend of mine and great, great guitar player from Austin, Mr Van Wilks. Early on, I discovered my fascination with his particular playing style. As we became pals, we started finding even more guitar-related common ground, for instance, Ida Presti. The young gal from France who became inspirational in ways that words cannot express. “Speaking of Austin, you’ve got Jimmie Vaughan, who simply has to be in this mix. Jimmie had a band out of Dallas, Texas called The Chessmen at the same time I was working in The Moving Sidewalks. The Chessmen were a five-piece band with Jimmie taking over the lead guitar spot, Doyle Bramhall Sr. was playing drums and singing with his remarkable voice, Bill Etheridge was on guitar and Tommy Carter on bass. “Then there’s the collection of great guitar players from Britain. Keith Richards, Jeff Beck, Jimmy Page, Mick Taylor, Peter Green, Mick Abraham. I’d call all of this the British block in my list. “Speaking of Jeff, he’s someone that has taken the divebomb into such an elegant and very delicate presentation. I became fascinated with his mastery of playing without a pick. “Hubert was a very interesting player. The lucky charm of all these people is the legacy that their recordings have left. They’ve allowed us to keep studying these technicians, most of which had the good fortune to make records which allows us to close our eyes today, thinking about what the music means and almost place ourselves in the studio watching it all go down. “And it’s repeatable! A live performance is wonderful, but it tends to evaporate. It’s there and it’s gone. The product of repeatability really allows us to find a solid ground in music, going back and back and back. “Eric is an absolutely terrifying player. He has a great tone that he once called his own attempt to become a 100-pound violin… which I think is brilliant. I remember reading that and absolutely loving the idea behind it. “This next block I’d like to give to the guitar players from a band called The Red Devils. Paul ‘The Kid’ Size on guitar, he had this real angry Strat, Stevie Ray Vaughan kind of tone. He would do this thing where he’d play a blues lick at speed and then all of sudden quicken the pace before anyone could see it coming. “For my list, Jimi Hendrix needs to be on there without question. That man was doing things with the Fender guitar that I can guarantee the designers never dreamed would be done to their instrument. It was all him who did it. The Big Bad Blues is out now on Snakefarm Records.